Let’s just call it, “The Dan Hardy Treatment.” After losing his fourth consecutive fight inside the Octagon, UFC president Dana White said they will not release featherweight Leonard Garcia (Pictured). 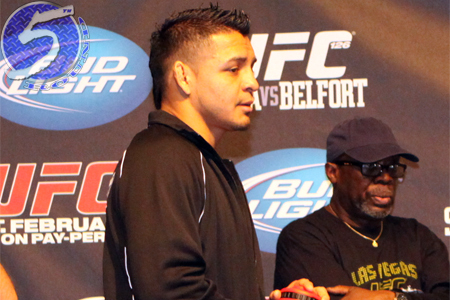 “There’s no way in hell we’re cutting Leonard Garcia,” White stated at the UFC 155 post-fight press conference. Garcia dropped a highly controversial split decision defeat to 21-year-old Max Holloway on Saturday night. White didn’t grant “Bad Boy” a reprieve because he felt Garcia should have won – in fact, White didn’t share his opinion on who he believed deserved to leave Las Vegas with the W, but admitted it was a difficult fight to score – he did so because Garcia’s reckless style always proves crowd-pleasing regardless of the outcome. The veteran now owns a mundane 15-10-1 professional record. Garcia has lost seven of his last 11 fights. His only wins during this disappointing run came in three controversial split decisions. The other bout on his current skid resulted in a split draw. The UFC refused to cut Hardy after dropping his fourth consecutive scrap because, like Garcia, “The Outlaw” always comes with it. The former welterweight top contender has since rattled off two straight victories.